A giant dome called the Vault of Heaven covers the earth, separating it from the vast ocean of the heavens. In this world, sea nymphs care for the stars in the sky, dedicating their lives to it. However, magic is fading, the stars are dying, and no one knows why. No one even speaks of it, carrying on like they have for tens of thousands of years, as if nothing has changed. In these circumstances, three sea nymphs and the living embodiment of a star struggle to find meaning in their lives and their fading world. 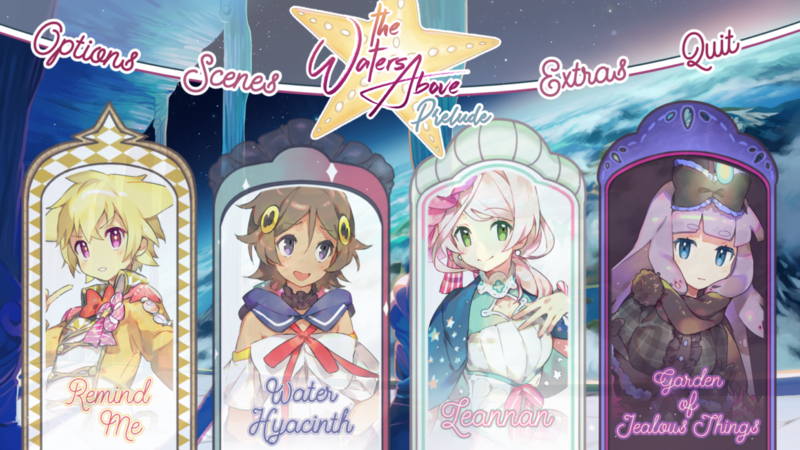 The Waters Above: Prelude is a free prequel to the upcoming kinetic yuri novel, The Waters Above presenting four short episodes each starring a main character from the game. Maera: A young and well-respected starkeeper. Clio: Maera’s girlfriend and the head of maintenance for the Celestial authority. Iris: The assistant archivist and researcher trying desperately to save the stars. Apple: The star in Maera’s care, and the first in ten thousand years to have a human form. Get The Waters Above: Prelude free now on Steam or itch.io!